Cathy and Andy got married at Deer Park Hall in Worcestershire. Deer Park is a stunning rural wedding venue sitting on the border between Worcestershire and Gloucestershire. Deer Park Hall has a fantastic balance of indoor and outdoor space, with a large paneled hall for wedding services, and a vast room for wedding breakfast that's glazed on two sides providing beautiful views over the Worcestershire countryside. Lamb's Leap Lawn presents an excellent opportunity for wedding photos, with a large expanse of lawn for your formal wedding photos, as well as many little hidden areas that make great places for your couples portraits. 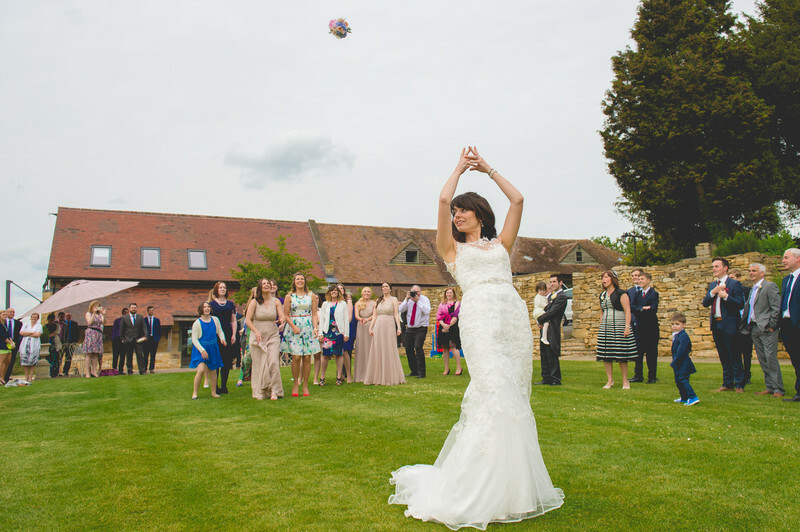 The main photo shows Cathy throwing her bridal bouquet, an age old tradition that's sadly seldom seen at today's weddings. I can completely understand why; wedding flowers are expensive and there are more ways than before of preserving your flowers and having them as a keepsake that lasts longer than a few days. The throwing of the bouquet however is still something that I love to photography. I've seen some hilarious throws over the years, some that don't make it more than a few feet and some that clear the awaiting ladies by miles! Cathy judged her throw well, perfectly presenting the flowers to the awaiting audience. If you look closely at the crowd waiting to catch the flowers, you'll see my second wedding photographer, Aaron, patiently waiting to capture a close up view of those flowers being plucked from the air.